I will explaining the process i followed to update HRTT and WebIDE environment and issues faced after the update. 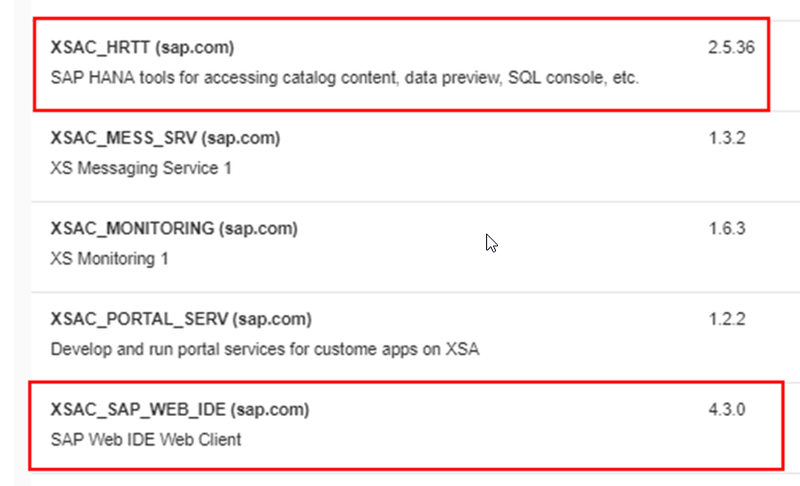 We are seeing gateway errors when trying to access objects from HDB module in XSA WebIDE environment, as a workaround i tried by creating new HDB Module and by restarting XSA and by restarting the HANA DB in a sequence but none of those help in fixing the issue. downloaded media listed under here from SAP SWDC and the mta file from note 2510063 ( this note number can change depending on the version you are on. xs install XSACHRTT07_33-70002322.ZIP –> executed successfully. xs install XSACSAPWEBIDE03_7-80002257.ZIP –e sap-xsac-devx.mtaext –> executed successfully. but still we are having the same issue and coudn't launch SAP WebIDE. after some manual validation it has been observed that the di-core was not starting and it was not being updated in the logs. starting the di-core as under fixed the issue here. issue could be due to not using the option "-o ALLOW_SC_SAME_VERSION" when updating the HRTT and WebIDE.